Our classes are a complete experience. Limited open studio access is included with 6-week courses. • Courses follow a syllabus that allows students to learn core techniques in sequence. 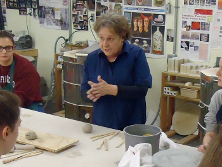 • Practice during Open Studio hours to advance your skills in the craft of ceramics. • Studio instructors are degree certified, working, and selling in Louisville! Up to 25 pounds clay, glaze, kiln-firing, and use of tools are included in the course fee. Additional clay is available for purchase. Please provide a $50.00 deposit at time of registration. Deposit is non-refundable. No refund for missed classes. 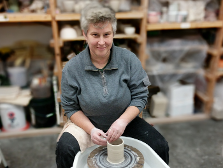 Alex has over 14 years experience working in the field of ceramics. Putting designs into production at the pottery wheel is his focus. Articulated forms are designed with a function in mind; wooden potter’s tools and artist-designed stamps bring each piece to life. Alex sells his work at local retail shops and boutiques in Louisville. 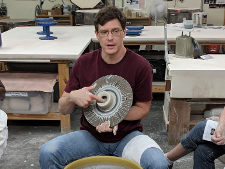 Alex earned a BA in ceramics from Berea College in 2008. Suzanne Adams has worked as an artist, educator, and community activist in Louisville, KY since 1980 when she moved from Minneapolis, MN. As an artist, Suzanne built a strong reputation which rose to a national level in the 90’s - 2000‘s. Works made of multi-media; including cast paper, paint, ceramic, wood, and wire, were presented at public and university exhibitions. Suzanne earned her BFA degree in sculpture/painting from the Minneapolis College of Art and Design with a graduate degree in education from the University of Louisville.